Bulk Personalized Luggage ID tags, ready to accept your business card or ID card. 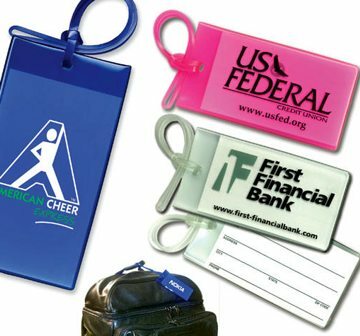 Budget Prices in USA and Canada for wholesale personalized luggage tags. American clients pay no taxes. Seamless case with matching strap is soft, flexible and extremely durable. It accommodates a standard business card (2" x 3.5"). Eye catching colors that stand out and get noticed on today's dark luggage. Stock ID Card is included, or use your own. Free artwork design. We will send you a proof for your approval before production. We also supply blank (not imprinted) Luggage ID Tags: please use NQP (next quantity pricing). These industry original Business Card ID Tags feature Soft-Touch™ feel, outstanding durability and a guaranteed permanent imprint. With a rainbow of color options, coordinating event graphics or a corporate ID logo has never been easier. Pricing includes a one color, one side imprint and includes a stock ID card inside. We also supply blank (not imprinted) Luggage ID Tags: please use NQP (next-quantity pricing). For instance, the unit cost of 250 blank ID Luggage Tags is $0.81 each. PRODUCTION TIME: 7 days after art approval; Contact us for 3-day production. Blank luggage tags ship next day. COLORS: Light Green, Green, Light Blue, Blue, Light Red, Red, Clear, Teal, Orange, Yellow, Smoke, Purple, Pink (see picture). Assortment is allowed. PRODUCTION TIME: 7 days after art approval; Contact us for 3-day production.